Great noise cancelling wireless earbuds for a reasonable price. If you’re shopping around for noise cancelling earbuds but don’t want to spend a fortune, the Plantronics BackBeat Go 410 acts as a great compromise of price and noise cancelling capabilities. The Go 410 sound signature will please average listeners with its emphasized bass and treble frequencies and fair price. While headphones and earbuds continue to grow more niche, some of us just want a nice pair of earbuds with a few fancy features to get us through the daily monotony. Well, enter the Plantronics BackBeat Go 410. These earbuds retail for ~$120 and boast effective noise cancelling, an ergonomic fit, and reliable connectivity. For those dubious about the neckband design, doubt no more, for the neckband found here is comfortable and flexible. Editor’s note: this list was updated on April 9, 2019, to reflect objective scoring methods. Who is the Plantronics BackBeat Go 410 for? For ~$120, the Plantronics BackBeat Go 410 provides impressive noise cancelling capabilities. Commuters. The noise cancelling effectively blocks out the subway rumble and does a decent job at attenuating nearby voices. What’s more, the earbuds are easy to pop in and out for sporadic conversation. Frequent flyers. Again, the BackBeat Go 410 is equipped to combat a noisy airplane engine. Plus, the compact, pliable design lends itself nicely to a one-bag lifestyle. If you must conserve the most amount of space, you can just wear them around your neck. and if the battery dies, you can use the convertible USB charging cable for wired listening. Listeners are provided with three pairs of ear tips varying in size, a mesh carrying pouch, a dual-use micro-USB cable that permits wired listening, and the earbud apparatus. 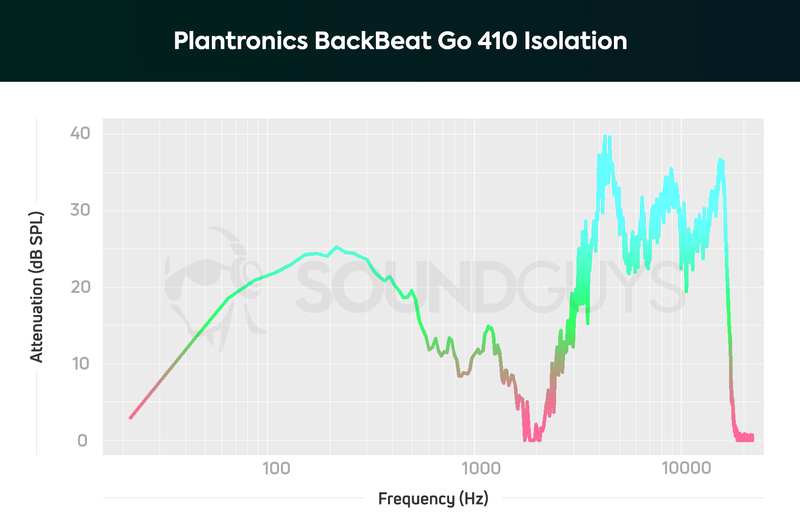 How is the Plantronics BackBeat Go 410 built? The earbud housings are small and discreet. A combination of plastic and rubberized silicone makes up the neckband earbud design. Much like the BeatsX and OnePlus Bullets Wireless, the soft-touch neckband is bendy and easy to forget when wearing it. Terminating both ends of the neckband are oblong plastic housings that contain the 180mAh battery and Bluetooth components. Active noise cancelling and the smart magnets features can be toggled directly from the headset or via the Plantronics app. Extending from the right side, the cable is broken up by an integrated three-button remote which allows for a slew of controls. For instance, pressing the minus and multifunction buttons for two seconds toggles the smart magnets, which activate and deactivate the active noise cancelling (ANC) when the magnetic housings are pressed together. Another useful feature results from holding the plus and multifunction buttons for two seconds: this turns ANC on/off. The convertible micro-USB cable allows for wired listening when the battery dies. The right earbud is easy to identify from the left due to its poppy red paint job, which is a design that more manufacturers should implement. While that’s cool, arguably one of the more novel features of the Plantronics BackBeat Go 410 is its convertible USB cable, which can both charge the earbuds and allow for wired listening if the battery dies. True, it looks like some kind of monstrous dongle-headphone jack device, but it works in a pinch. If you want to stick within the Plantronics brand and while getting the latest and greatest in workout audio, check out the Plantrnoics BackBeat Fit 3100. Although the Plantronics BackBeat Go 410 is sweat-resistant, it hasn’t received an official IP rating like the BackBeat Fit 3100. Additionally, the neckband design isn’t the best for vigorous workouts. When running, it bobs up and down relentlessly and when weight-lifting, the neckband slides down my back during a bench press. It is appreciated, however, that the buttons are easy to distinguish and that listeners can access their virtual assistants via the center button. The microphone works. It does an all right job minimizing background noise and parlaying the speaker’s voice well. For Plantronics, though, a brand that typically excels in this area, it’s nothing to write home about. Additionally, the placement makes it easy to inadvertently rub the microphone against a jacket collar mid-conversation, causing the person on the other line to bust an eardrum. With noise cancelling active, listeners get about eight hours of playback. With the noise cancelling turned on, our objective testing resulted in 7.88 hours of constant playback from the Plantronics BackBeat Go 410. This is impressive given that Plantronics’ posited battery life is eight hours. While our results seem a tad short from the company’s, we subject all wireless earbuds and headphones to a constant 75dB(SPL) output, which is louder than most will consistently listen to. These earbuds seem battery-oriented seeing as they enter DeepSleep mode after 90 minutes of inactivity to conserve energy. What’s more, listeners will be able to squeeze 10 hours of playback without active noise cancelling turned on and 50 hours of battery life with just noise cancelling turned on sans media playback. Listeners can adjust everything via a combination of button presses on the in-line remote. Operating via Class 1 Bluetooth 5.0 affords a 98-foot wireless range with the Plantronics BackBeat Go 410. Generally speaking, connectivity is reliable. The only instance it stuttered was when I left my phone in my apartment and took a flight of stairs to the next level. Bluetooth codec options are sparse with just SBC available. This means that video streaming lags a twinge and wireless audio quality isn’t optimal, regardless of if you’re listening via iPhone or Android. On the flip side, however, listeners can connect two devices simultaneously, a feature often included in Plantronics earbuds. The Plantrnoics BackBeat Go 410 features a bass-heavy sound that lacks clarity. Noise cancellation is superb and readily combats rumbling traffic and hurried footsteps. This is a textbook consumer-friendly sound signature: sub-bass and common vocal frequencies are emphasized while upper bass and lower midrange frequencies remain audible but may fall to the auditory wayside. The exaggerated bass makes the noise cancelling seem even more effective, while the altered highs feign clarity. Although clarity is sub-par, the general sound is a pleasing—albeit inaccurate—especially to the nondiscriminant ear. The star of Julia Nunes’ poppy song Make Out, is Nunes’ ukulele, which remains a constant presence throughout the melody. Although the harmonic resonance of the ukulele strumming is slightly emphasized, it’s masked during the choruses when the kick drum enters full force. Additionally, Nunes’ lower register is occasionally lost to the commotion; this is most obvious during the bridge at 1:56. The Yeah Yeah Yeahs’ early 2000s hit song Maps leads with a D chord played from the electric guitar. While the chord’s resonance is distorted, it isn’t so off base that it’s fatiguing. Any potential for auditory fatigue disappears once the drum kicks in at 0:15 and masks the high-frequency reverberations. Listeners can alternate between high and low noise cancelling modes depending on the environment. The automatic switching is effective, so much so that I wouldn’t recommend using these when crossing the street. It’s just too risky since the environment becomes so distant. It will, however, aid in the prevention of noise-induced hearing loss: the attenuated background noise is less likely to cause auditory masking; plus, the passive isolation isn’t too shabby either. Should you buy the Plantronics BackBeat Go 410? Angled ear tips promote a more comfortable fit and reliable seal. Quite frankly, it’s hard to believe that these earbuds can be had for just $120 when the Sennheiser HD1 In-Ear Wireless, which lacks noise cancelling, originally retailed for $200. The noise cancelling performance is superb, making the Plantronics BackBeat Go 410 an earnest contender in the noise cancelling earbud domain. Although the audio quality isn’t going to impress self-proclaimed audiophiles, that’s fine. These aren’t intended for studio use. Insteaed, the earbuds are meant to be versatile, comfortable, and practical, all of which they are.